Search the word “idiot” on Google images and you are likely to see a familiar face pop up—none other than President Donald Trump. When it comes to its search algorithm, Google has been adamant in its refusal to intervene with results, no matter who they offend. The company was steadfast in that commitment even in 2009, when searches for then-first lady Michelle Obama began returning image results showing a picture of her face altered to have ape-like features. Rather than pull the racially offensive image, Google opted to instead use ad space to explain why it was appearing in its search. Photos of Trump have their made their way to the top of the search engine’s image results page after activists in Britain adopted the Green Day song “American Idiot” as their anthem to rally against the president’s recent London visit. 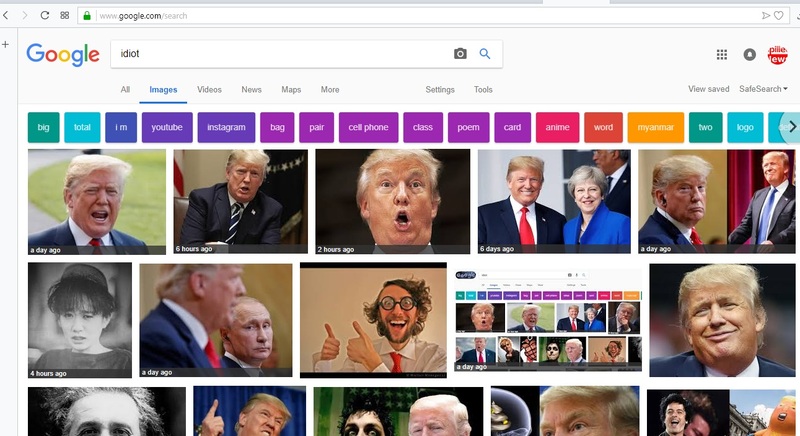 The president’s photo appears in four of the top five results of a Google image search. The other photo included in the results appears to be of Britain-based journalist and activist Ash Sarkar, who called Good Morning Britain host Piers Morgan an idiot during an interview over her plans to protest Trump’s visit to Westminster. Trump, who has previously touted his high IQ and declared himself a “stable genius” likely won’t be too happy about his newfound popularity on the Google images page. However, if the U.S. leader expects the search engine’s head honchos to intervene, he is likely out of luck.